Hello, how are you doing? I hope you’ve had a good week. I’m not going to witter on about my Monday – Thursday working but I was lucky enough to have a voucher (from Christmas 2013) to attend a day at a *brand name* cookery school in London yesterday. Now I will confess that after a pretty hectic week, I was tired and not particularly enthusiastic to attend but, it surprised me with how good the day actually was! We arrived to find tea, coffee and breakfast laid out. Most of the 20 of us were there on our own so it was a time to meet people and work out who you’d be partnered with. Then …. it was off to be introduced to the kitchen and into the theatre for the first demonstration. 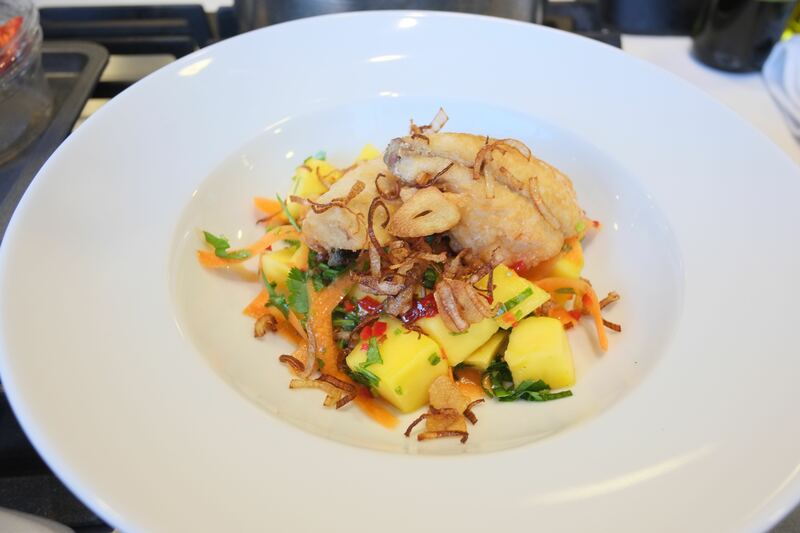 It was a fish cookery course and first of all we were making deep fried seabass fillets with a mango, carrot and herb salad, an amazing chilli caramel sauce and some deep fried onion and garlic crumbled on the top. Watching the chef was impressive, even just how to chop things, then seeing how to gut a fish (ugh) and then fillet it and do all the stages. The dish created was stunning in terms of presentation and then we got to taste and give it a go ourselves …. It turned out better than I thought it might and tasted lovely. The crispiness of the seabass and the sweetness of the mango went lovely together. Filleting the fish was a bit of a challenge though, one side is definitely easier than the other and I am afraid to admit I passed on the challenge of gutting it to my partner. and then tucked into plate number two. The stew had aioli through it (now that is something I want to try making at home) and I think we had a little much as it was soooooo garlicky. 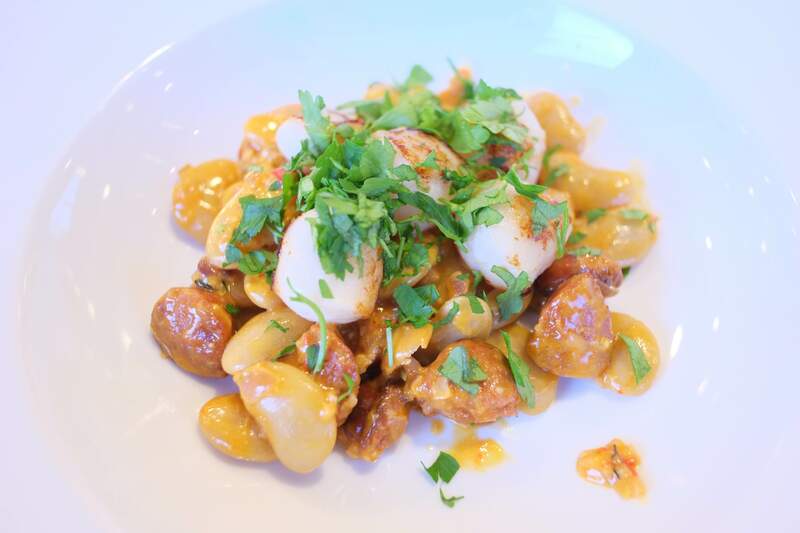 The chorizo with the scallops was a lovely combination. Finally it was time for “lunch”. As if we needed any more food after the first two courses. This last time it was learning how to fillet a flat fish – plaice, then skin the fillet and make a mussel beurre blanc. I enjoyed filleting the plaice more than the sea bass. Not quite sure if it was practice or just that the flat fish was flatter so easier with the knife and that we didn’t have to gut it this time. 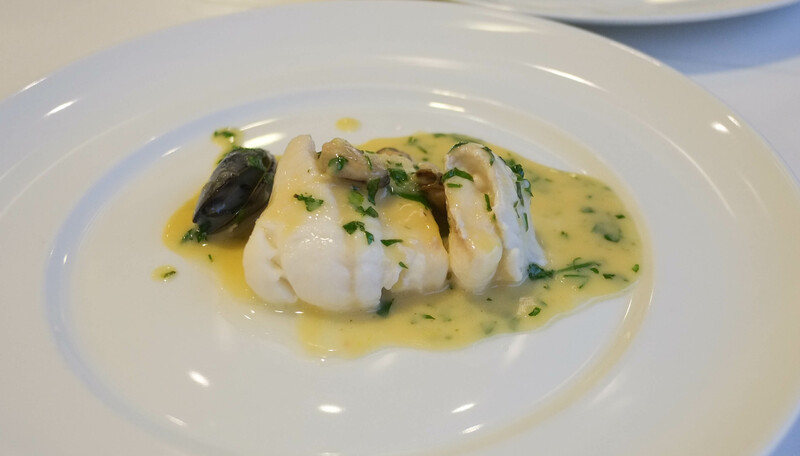 We steamed the plaice in little parcels, cooked the mussels in white wine then used the fish juice and some fish stock reduced down with melted butter whisked through it to make the beurre blanc. Considering how unimpressive it looked, it was seriously yum! By that point, I’d reached my energy limit and knew it was time to go so as not to need to spend the weekend in bed. A much better day than I expected and it certainly has given me confidence on ways to cook fish. Something I would recommend. < 2015 Photo a day, set 1.